Port St. Lucie, Florida—Almost 100 people attended the St. Lucie Medical Center Ribbon Cutting Ceremony where it was announced that St. Lucie Medical Center will continue to put patient needs first by being the first on the Treasure Coast to open a Senior Emergency Room (ER) and expand into western St. Lucie County with a freestanding emergency department at Darwin Square. Officials held a ribbon cutting ceremony for the 16,000-square-foot-facility expansion located at 1800 S.E. Tiffany Ave. “With the growing demand for emergency care, this newly renovated emergency department offers patients throughout Port St. Lucie and the Treasure Coast access to quality emergency services, coupled with the first Senior ER, all in one convenient location,” said Jay Finnegan, chief executive officer of St. Lucie Medical Center. 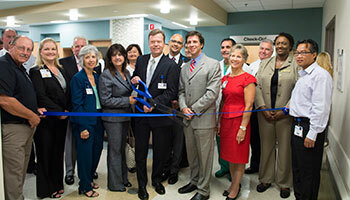 St. Lucie Medical Center began the $9.3 million dollar expansion of its Emergency Department in early April 2014 in order to have the state-of-the art facilities to match the high quality care provided to its patients. Key features include: 35 all-private rooms: 3 new trauma rooms, 1 isolation room, 1 behavioral health room, 1 OB/GYN room, 4 “Fast Track” rooms, 9 observation rooms; an increase of 10,000 square feet; two new canopy entrances; new EMS lounge; and dedicated senior rooms and services. “Our new Senior ER will provide those over 65 the special attention when they are in need of care. While our ER staff provides prompt, quality care to every patient, we recognize that seniors have specific needs. Our Senior ER aims to please our rapidly growing senior community,” said Jim Kruger, RN, BS, CEN, associate vice president of nursing and emergency services. The St. Lucie Medical Center ER located at Darwin Square will be equipped to handle any emergency situation and built with special consideration for pediatric and geriatric patients and their families.